Acomprehensive model of Saturn's magnetosphere and moons has revealedthat theringed planet's largest moon Titan gets its oxygen from the icy geysersonanother. Until now,the method for oxygen making its way into Titan'ssurface chemistry has remained a mystery, the scientists saidin a NASAstatement. Icy geyserson Saturn's moonEnceladus shoot watermolecules into the planet'smagnetosphere, where they break down into oxygen and hydrogen as theytravel toTitan, according to a model developed by scientists at NASA's GoddardSpaceFlight Center in Greenbelt, Md. "Titanand Enceladus, another icy moon of Saturn, are chemically connected bythe flowof material through the Saturn system," said John Cooper, a plasmaspectrometer team scientist with NASA's Cassini mission to Saturn, in arecentstatement. Cooper andfellow Cassini scientist Edward Sittler led two different studies intothetransportation of oxygen between Enceladus and Titan. NASA announcedtheresearch this month. 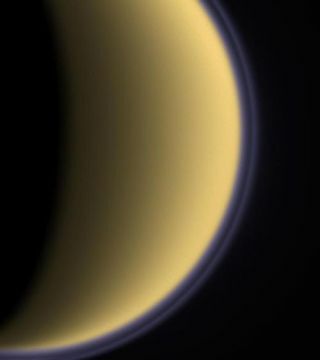 Scientistshave known that Titan'satmosphere receives aninfusion of oxygen ionssince 2004, when it was detected by the Cassini spacecraft currentlyorbitingSaturn. At the time,the very tiny amounts of the gas and their high energy surprisedscientistsaccustomed to a Titan atmosphere composed mostly of nitrogen, but theywrote itoff as the breakup of icy interplanetary grains of dust. Though roughly10 times smaller than Titan, Enceladus was observed dumping 661 pounds(300 kg)of frozen water every second into Saturn's magnetosphere, researcherssaid. Gasbeneath a cavity of water on the moon's south pole continuously buildsup,causing water to erupt from cracks on the icy surface. The icy jetsescape Enceladus in plumes of vapor similar to the Old Faithful Geyserat YellowstonePark in the U.S., reaching orbit easily because the moon's escapevelocity isonly a few hundred meters per second, Sittler said. In theirstudies, the two researchers found that oxygen particles can attach tosoccerball-shaped carbon molecules called fullerenes on Titan after theymigrate tothe cloud-covered moon from Enceladus. Thesefullerene cages protect the oxygen reacting with the methane in Titan'satmosphere and could ultimately reach the moon's surface attached todustparticles, the researchers said. It's aunique setup, and one that arises only because of Saturn and itsinteractionswith its moons. "That'swhat's unique about this whole story: you need Titan, you needEnceladus, andyou need the magnetosphere," Sittler told SPACE.com. Furthermore,the fullerene hydrocarbons form some of the building blocks of morecomplexcompounds, Sittler said. When radiated by highly energetic cosmic rays,theoxygen immersed in these molecules can produce amino acids, thefoundation of pre-biologicalchemistry. At 10 hoursand 29 minutes, the rotation of Saturn subjects materials in itsmagnetosphereto velocities similar to those found in a particle accelerator, morethanenough to break down water molecules from Enceladus into theircomponent parts. By the timemolecules are ripped apart and headed for the upper atmospheres ofnearbymoons, they are energetic enough to pierce the cages of fullerene,researcherssaid. "Youneed energetic reactions to get the molecules in the fullerenes,"Sittler explained,likening the action to shooting a particle through a solid ball. Once oxygenatoms are trapped in the hollow fullerene balls, the molecules cancondenseinto aerosols and act as protection and crucible for chemicalreactions. Aerosols aredust particles that can cause the reddish glow seen on Earth duringsunset.They are large enough to gradually fall with time, making them a viablepathfor oxygen to be transported to the Titan surface, researcherssaid. Without theprotection of the fullerenes in Titan's hydrocarbon-rich atmosphere,oxygenatoms would react with the moon's methane to produce carbon dioxide orcarbonmonoxide, they added.